Born in Berlin, Germany on 5th February 1921 to a former military man, Adam's name at birth was Klaus Hugo Adam. In 1934, the family moved to London, UK and 13 year-old Klaus changed his name to Ken. After schooling at St. Paul's, Adam decided he wished to study to be an architect and attended the Bartlett School of Architecture. During the war Adam was recruited to the army to assist in the design of ballistic shelters. Despite being a German national, the Army were only too grateful for Ken's skills. He later joined the Royal Pioneer Corps, a regiment that was set up for nationals of the Axis countries that were trusted to serve the Allies. He quickly became one of only two German-born pilots flying for the British and was promoted to Flight Lieutenant and served a successful career with the RAF. When the war was over, Adam had the opportunity to work as a draughtsman in 1948 on the production of "Third Time Lucky". He served this role on several productions, uncredited for much of the late 1940s. He won a slight promotion to associate art director, assisting the creative team on "Captain Horatio Hornblower R.N. ", but still did not win his name in the credits. He earned a break on two big Hollywood adventures, "Around the World in 80 Days" and "Ben-Hur". On the former he worked as an art director for the London shoot and served as assistant art director on the latter. His first opportunity to helm an art department came with "Soho Incident" (1956), a forgettable crime/drama. Adam moved on from here to "The Rough and the Smooth" (1959) and the daring production of "The Trials of Oscar Wilde" (1960) - where Adam met would-be Bond producer Cubby Broccoli. When Broccoli and Saltzman had done their deal for Bond, Broccoli turned to Adam - still relatively fresh in the industry to production design "Dr. No" (1962). Ken Adam pulled out all the stops - and was remarkably at home in the futuristic and lavish world of James Bond, with Dr. No's interview chamber (in which Dent receives the spider) becoming a lasting icon of the series. 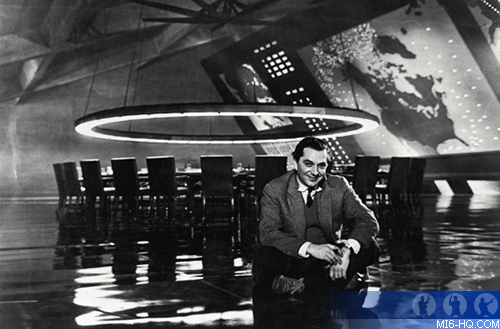 Above: Ken Adam on the set of Dr. Strangelove. Adam was now impressing the right people, so much so that Stanley Kubrick called upon the designer to helm his art department for spy-spoof "Dr. Strangelove" in 1964. The same year, Adam returned to the Bond films for "Goldfinger" - having missed out on "From Russia With Love". Adam's name will forever be synonymous with his construction of the $1 million volcano set for the big-budget "You Only Live Twice". A challenge to build in time, light and shoot in, Adam and the entire art team worked tirelessly on its construction from the moment Cubby Broccoli approved the project, to the moment that Lewis Gilbert rolled cameras on the set months later. In the mid 1960s Saltzman worked with Adam on the gritty Cold War thrillers "The Ipcress File" (1965) and "Funeral In Berlin" (1966). 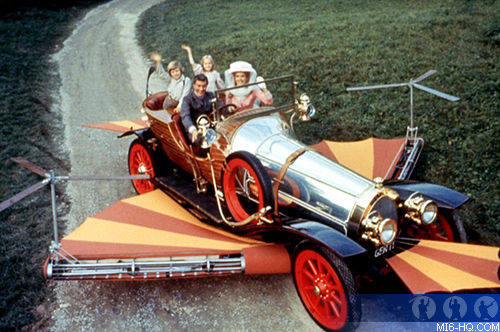 Above: Chitty Chitty Bang Bang designed by Ken Adam. Adam worked on Cubby Broccoli's non-Bond family adventure "Chitty Chitty Bang Bang". Arguably the real star of the film was the Ken Adam-designed supercar. Much like the volcano lair for "Twice", Adam had another engineering challenge to face: designing, a stylish, 1920s, flying, ocean-going, family-sized car. No expense was spared in the creation and construction of Chitty Chitty Bang Bang herself. "My designs were in influenced by some of the old Rolls Royces. If I remember rightly we had a shipbuilder to do the actual bodywork," Adam explained some years later. He also worked with Alan Mann, Tour de France winner of 1964, to engineer the road-going 'hero' car. When Mann met with the film's production designer, Adam had an inkling of how the car could come together. Adam explained to Mann that he had never seen anything like it, but it was all in his mind. The race engineer had Adam sketch, on the spot, some idea of how Chitty might look, explaining that if it can be drawn it could be built. 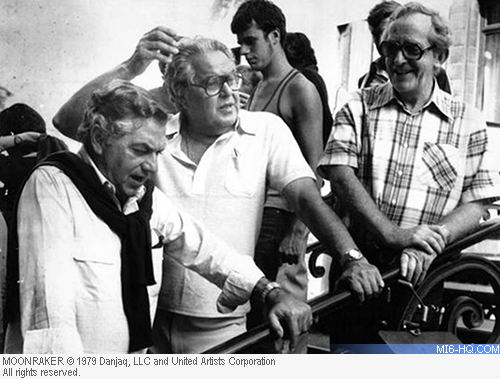 Above: Adam, with Cubby Broccoli and director Lewis Gilbert on the set of "Moonraker". In the 1970s the designer worked on films such as "The Last of Sheila" (1973), "The Spy Who Loved Me" (1977), and Kubrick's "Barry Lyndon" (1975), which earned Adam his first of two Oscars. Adam's swan song Bond adventure would the the, again, larger-than-life "Moonraker" (1979). The 1980s were quiet for Adam, with Peter Lamont taking over his regular role in the Bond family, but his astounding work on "The Madness of King George" (1994) would earn him his second Oscar. In 2003, Ken Adam was knighted for his services to filmmaking and to Anglo-German relations. For his final credit, Ken Adam contributed to EA Games' 2004 "GoldenEye: Rogue Agent" to help create concept art for their in-game videos and maps. 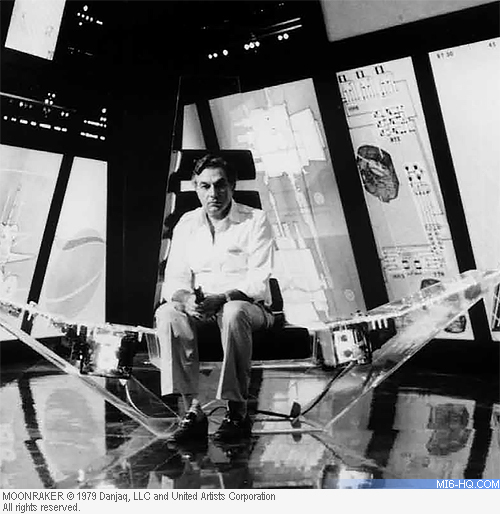 Above: Sir Ken Adam on the launch centre set set of "Moonraker". Well into his nineties Adam made public appearances and continued to share his experiences with the community of film aficionados who admired his work. He passed away on Thursday 10th March at his London home. His biographer and close friend Christopher Frayling broke the news to the BBC, commenting: "As a person he was remarkable. Roger Moore once said about him that his life was a great deal more interesting than most of the films that he designed."